Most hot runner companies focus on selling components rather than helping you achieve your processing requirements. When Joachim Neumann formed J-Tech HotRunner to design and build hot runner systems for demanding applications, he had already spent 20 years watching suppliers and hot runner companies point their fingers at each other. For simple projects, hot runner systems are relatively trivial and toolmakers and molders can buy off the shelf components from any vendor to assemble their own systems. But for modern applications, and applications that push current processing limits, hot runner systems must be highly engineered to ensure first shot success and ongoing cost-effectiveness. After having been personally involved with the design, manufacturing, and assembly of over a thousand successful systems, Neumann has earned a solid reputation. Three years ago Neumann delivered a large 123-drop system for an energy management bumper system that other vendors said could not be done. One company tried five times and failed miserably. The complexity of this project was not in building the tool, but in developing a hot runner system and temperature control strategy that was tuned to the unusual geometry of the part and flow characteristics of the material. The system continues to perform flawlessly and has undergone only one hour of maintenance (a single nozzle change). More recently, a 24-drop system was delivered for a part with a weight of only 0.107 grams molding PA6.6. Most vendors are unwilling to tackle such projects because of the high risk of thermal degradation of the material in the hot runner system. 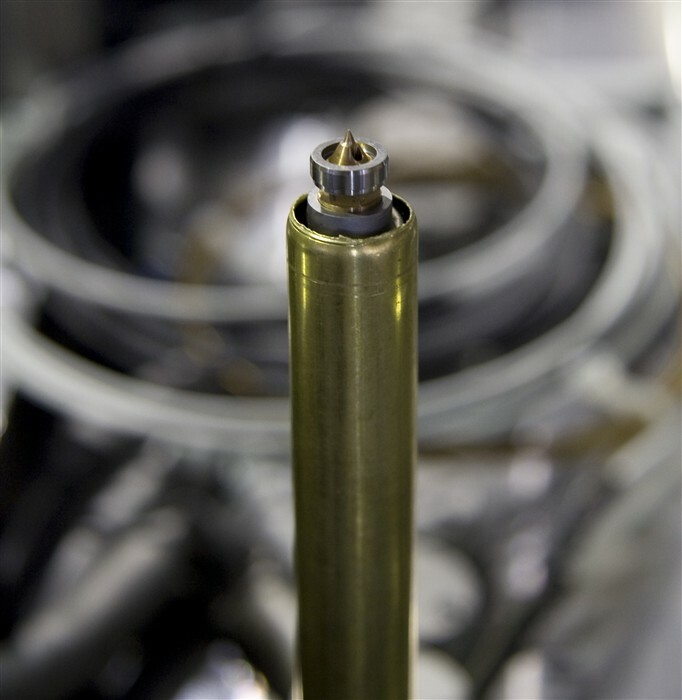 Neumann's engineers looked at the material properties and cycle time requirements to design a manifold system with extremely small melt-channels and customized the nozzle diameters. With confidence in their research and development, the company is able to work with customers knowing that their systems will work the first time. J-Tech HotRunner offers ready to run hot-halves as well as a full range of nozzles for your application, including valve gates, multi-tip, flat, extended length, plus a variety of gating options. The company also offers the industry's smallest nozzle that allows for cavity spacing as small as 7mm.